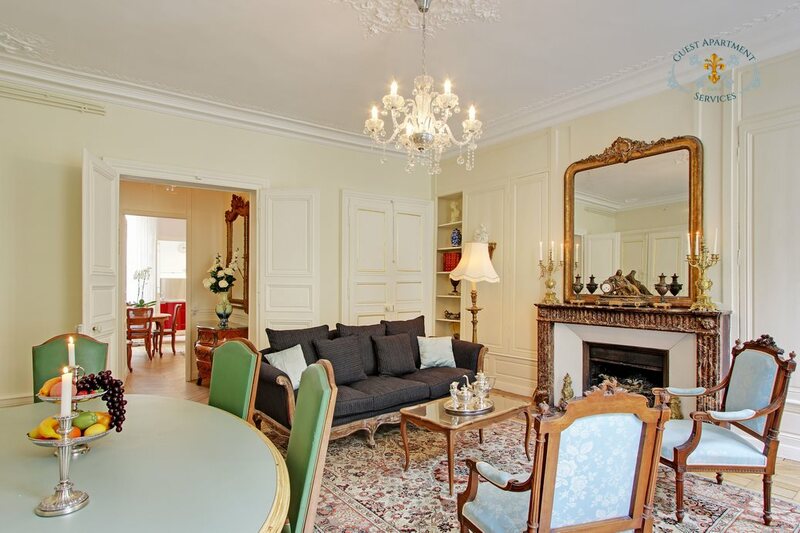 A prestigious Family apartment on Ile Saint Louis. 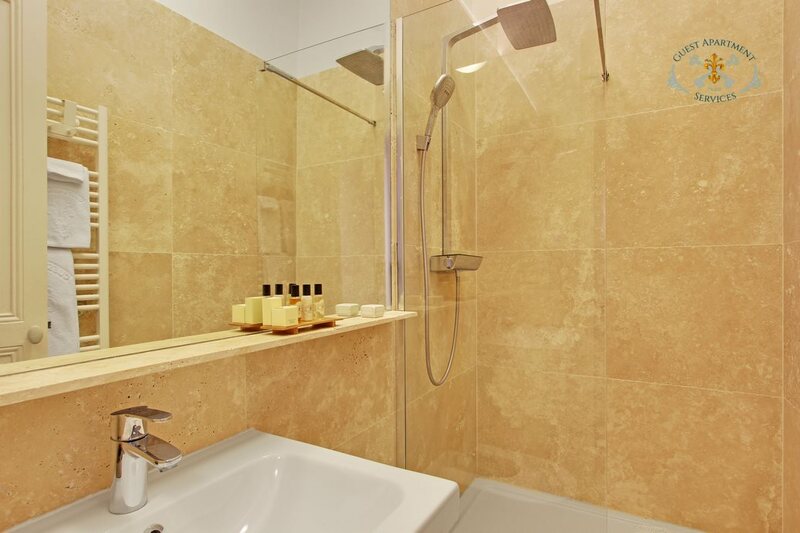 Large walk in shower with a wash basin, toiletries and a towel warmer. A separate lavatory is independently accessible from each bedroom. On the Isle Saint Louis you will discover a building which hides a mark of the past. 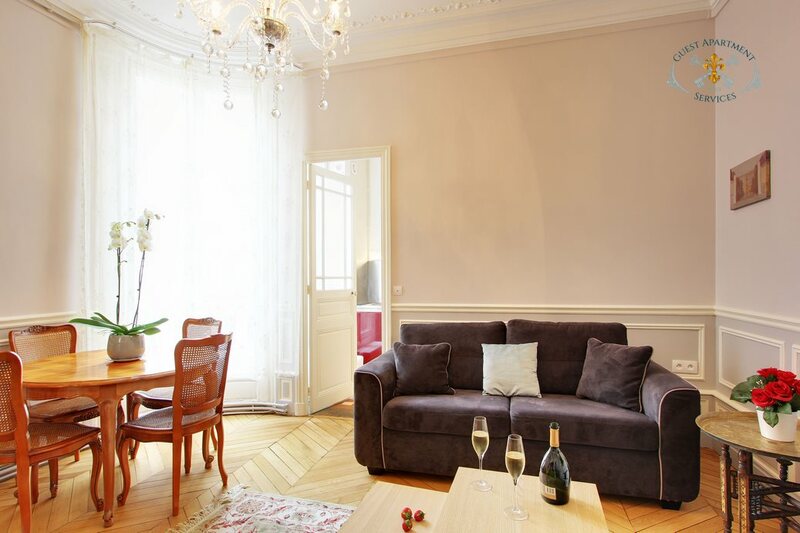 This apartment, is a testimony to the “Haussmann” period adapted to the comforts and the convenience of today. All the shopping conveniences are to be discovered nearly at your door: a pharmacy, a post office, a news agent, bakery and pastry, groceries and other shops. 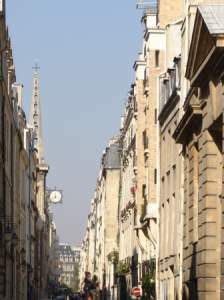 Other services, traditional restaurants and brasseries, cafés, art galleries, as well as shops with fresh typical French products are to be found on the Isle. The Isle feels like a village inside of Paris. The quays which surround the island are the perfect for romantic walks. Crossing one of the six bridges you will enjoy either the right or left bank for a wider range of shops. 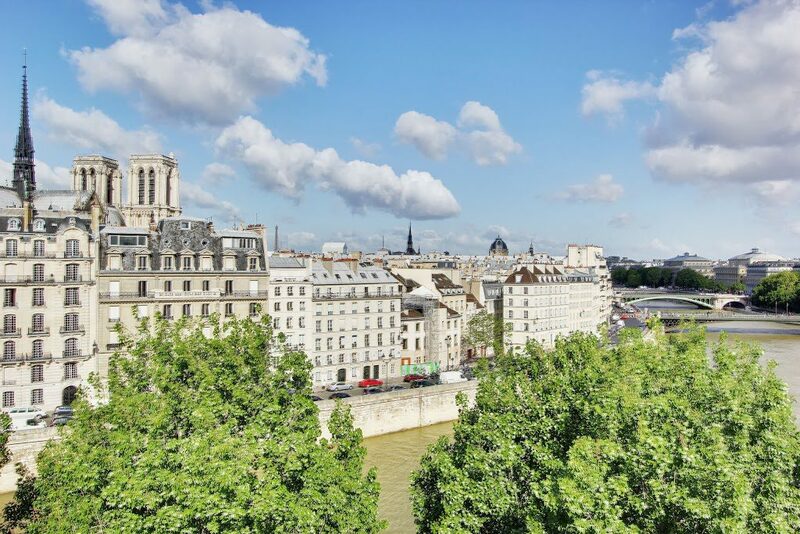 The most important and attractive cultural places are located close by the Isle Saint Louis : Notre Dame Cathedral, the Louvre Museum, the Pompidou Centre, the Left Bank and Latin Quarter, and Sainte Chapelle are all within easy walking distance. 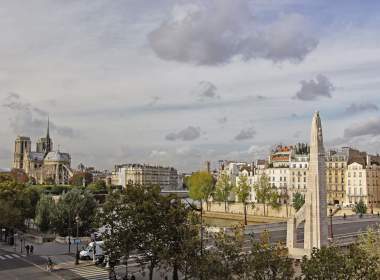 The metro line 1, the main subway line, is easily accessible at the nearby Saint Paul metro station and goes directly to many of the most important sights. 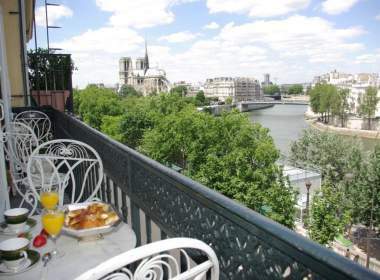 Metro line 7 is also easily accessible at the nearby Pont Marie metro station. 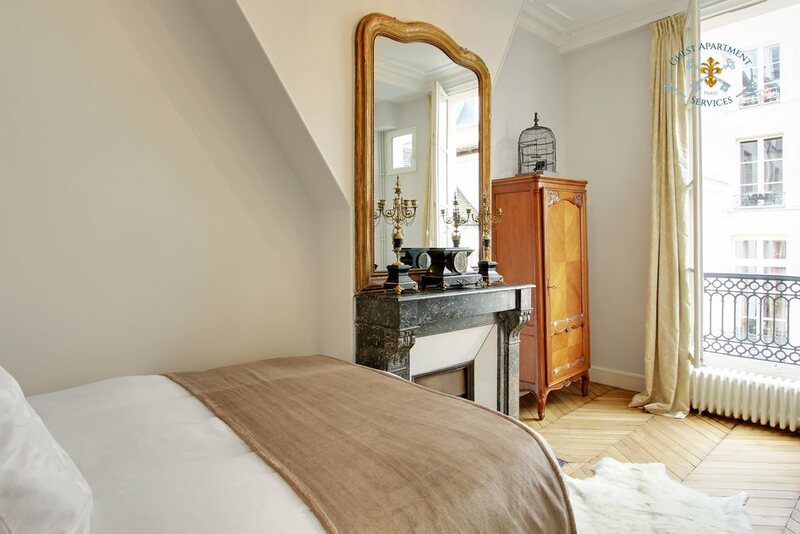 This prestigious second floor apartment is located in a building that has been transformed onto a Haussmannian living style, without disturbing the classic architecture of the Isle Saint Louis. 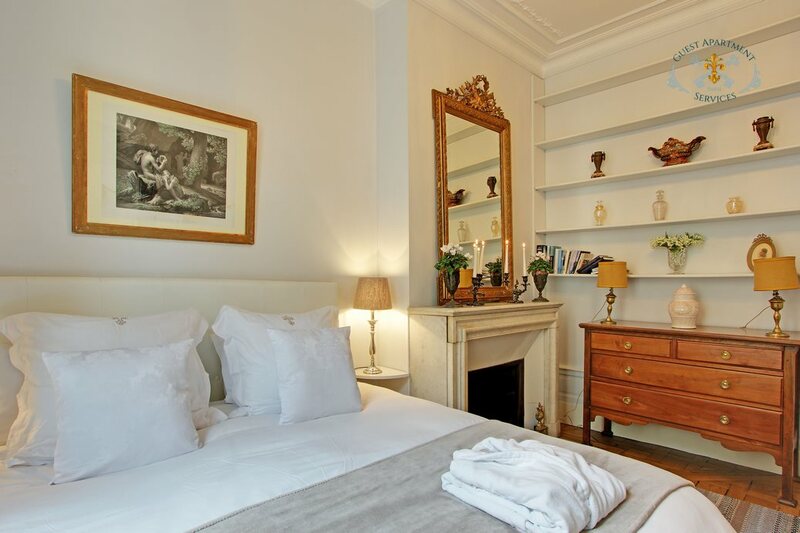 This tastefully furnished two bedroom apartment has been transformed at the end of the 19th century into an elegant family home. 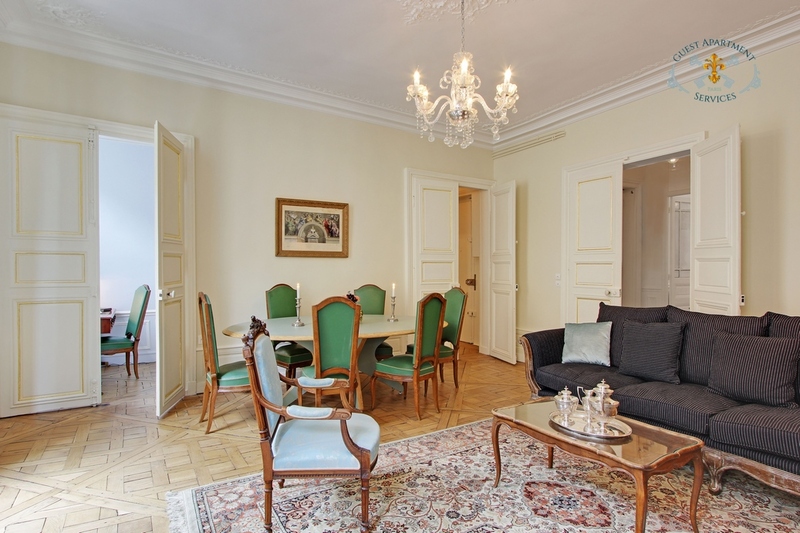 The entire space is made of original parquet floors, high ceilings decorated with moldings and ceiling roses, elegant volumes and furnishing, marble fireplaces and seven large windows. The feel is of a unique 19th Century elegance and spacious openness. The wall colours are soothing blue and cream. The 109 square meters apartment occupy all the 2nd floor. 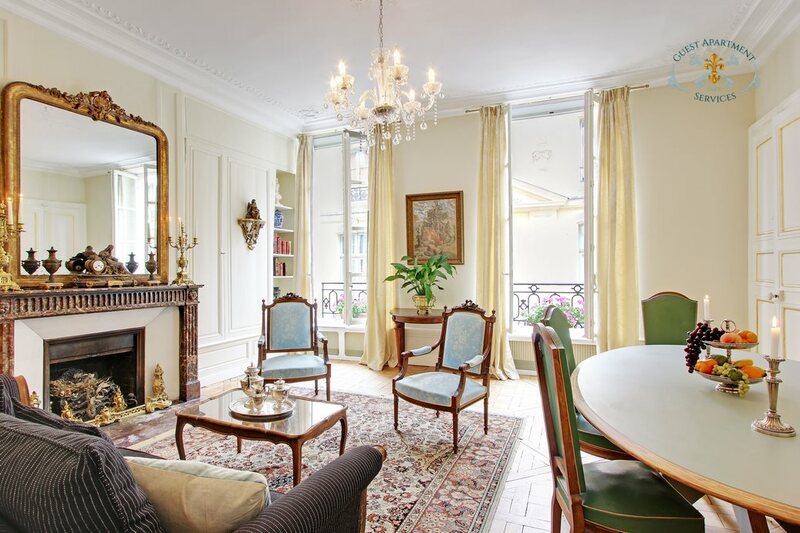 It has been recently renovated in an elegant style that highlights the Haussmaniann designs upon the woodwork, the parquet floor and the extravagant spaciousness of the floorplan. 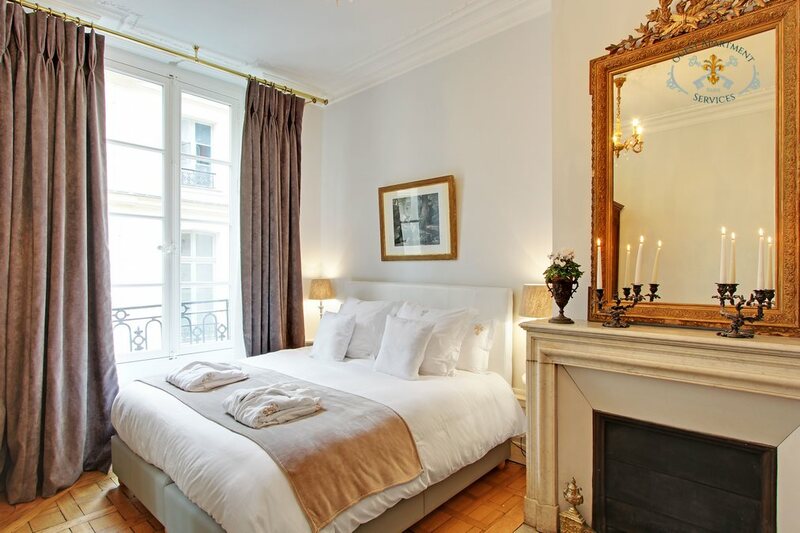 Light, space, and most of all energy flows through the apartment, and the seven French windows. This is a space that invites one to relax, to contemplate and to enjoy. After the foyer entrance, a large staircase gives access to the apartment after walking 2 flights of stairs. One steps directly through the entrance Hall. 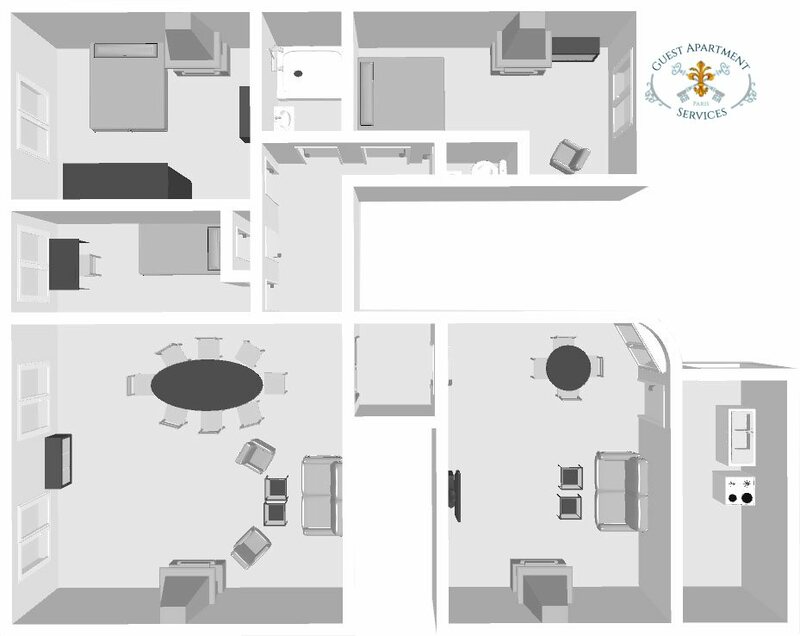 The apartment is organized in 3 areas: on the left the family room and the kitchen facing the large paved courtyard, on the right the spacious living room with 2 high French windows overlooking a spectacular 17th Century Townhouse, and the bedrooms area that includes the master bedroom, a second bedroom and the little office that accommodate a single person. The spacious Main salon will give you the spirit of elegance with the Versailles style parquet floor, the majestuous marble fireplace adorned with an antic mirror, the two high French windows and the various mouldings on the ceiling with a glass chandelier. As for the seating arrangement, a large sofa seat comfortably 3 persons and is centred on an antic table. Two Louis 16th style armchairs and an elegant carpet with floral pattern complete this area, perfect for conviviality, a calm rest after a long day of cultural visits or listening to music. Along the main wall, a spectacular oval table seats 6 persons for family or friends great dinners. The Master bedroom offers a King size bed. A large antic mirror cupboard offer enough space for the elegant dinner outfits. 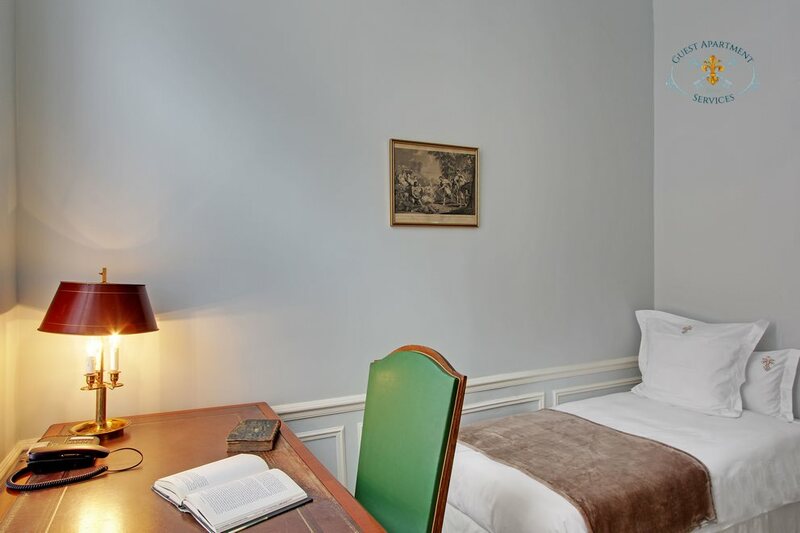 Two reading lamps on each side of the bed create a cosy relaxing ambience. 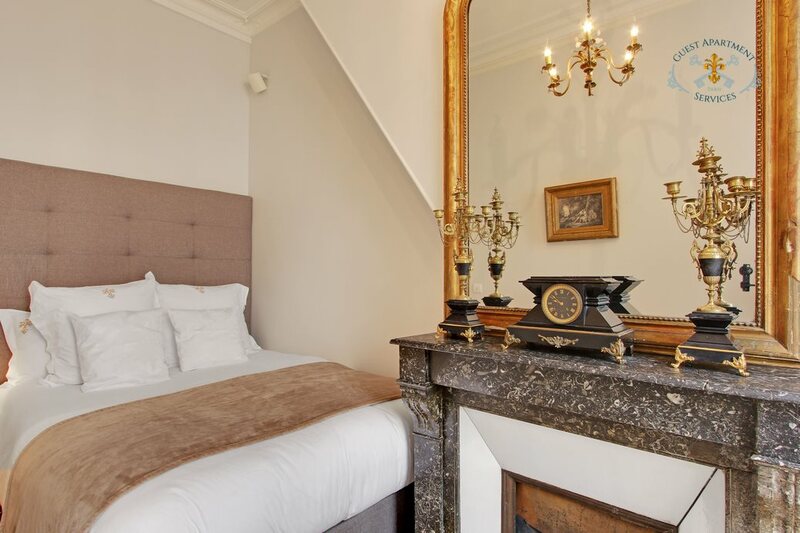 The marble Chimney adorned with a spectacular antic mirror complete the elegant ambience of the room. The peaceful second bedroom faces the courtyard. 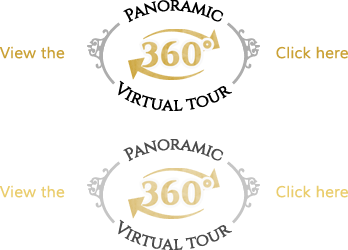 It offers a comfortable new double bed and a little rustic cupboard. The third separate bedroom is also an office with a spectacular desk facing the high window. It welcomes a day-bed couch. In between, the bathroom offers a large walk in shower with a wash basin, toiletries and a towel warmer. 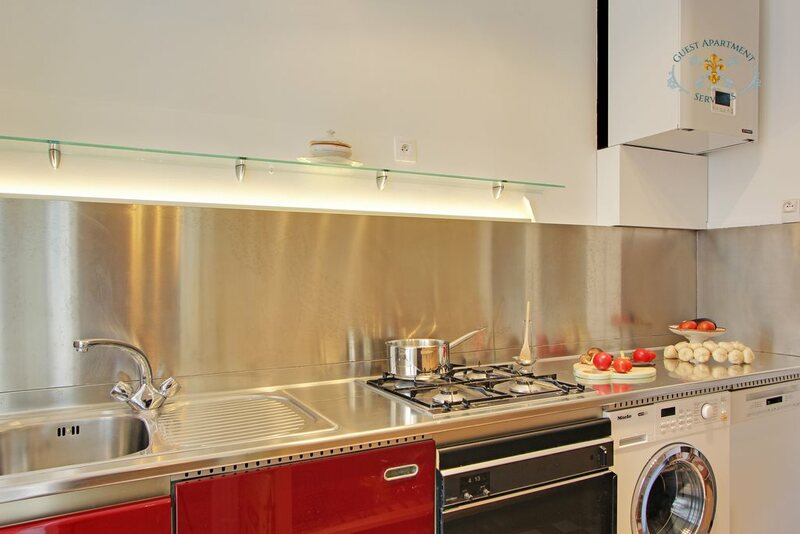 The fully equipped kitchen is in a separate area of the apartment, near the family room. For your comfort there is a stove with 4 gas burners, microwave, oven and fridge, freezer, coffee maker, toaster and electrical kettle. 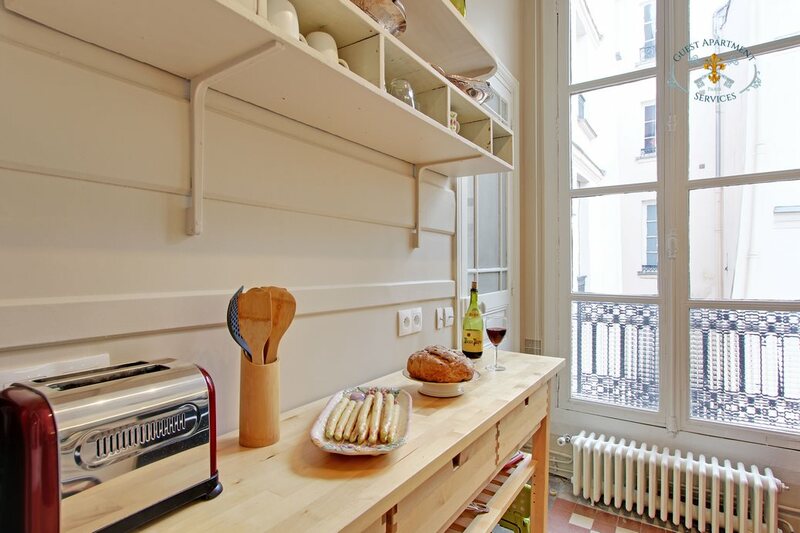 All necessary cutlery, glassware and crockery are available in the large built in cabinet. A dishwasher and a washer dryer are also available. The family room is bathed with a relaxing soft light coming from the bow window overlooking the courtyard. It is spacious and appointed with taste and harmony. By the window a circular table with fluted chairs welcome the family meals. By the Ceramic Austrian style chimney the comfortable sofa is an invitation for a drink before dinner. It is facing the plasma television screen, above the antic dresser. 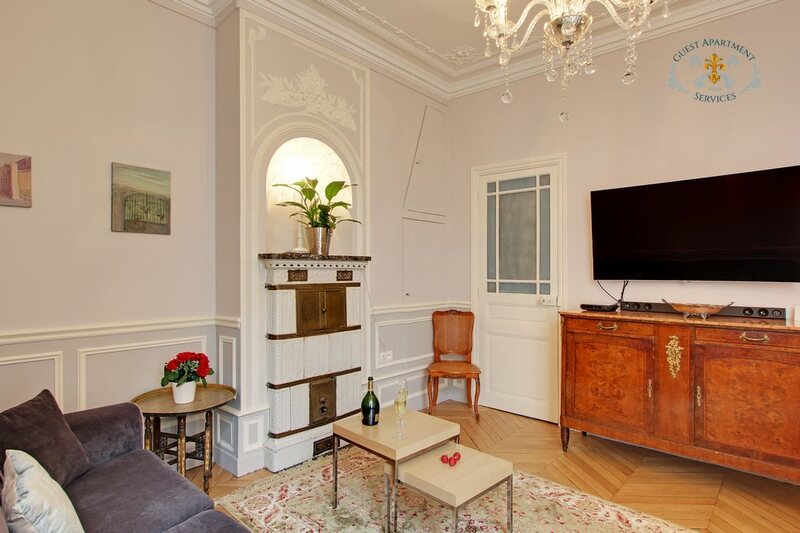 NOTE: Free WIFI & High Speed internet with unlimited connection is provided as in all our Paris apartment rentals. This is a non-smoking apartment. For security and sanitary reasons, pets are not allowed. Pitch perfect. Bluebell proved to be the most delicious place I’ve ever stayed in Paris and the team at Guest Apartment Services were obliging and welcoming. Don’t hesitate. Book!